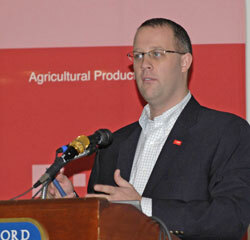 Scott Asher is a BASF Diversified Regional Manager. He spoke today at their Cotton Consultants Conference and provided some technical information about the product. Scott says that BASF has a variety of activities planned for growers here that ranges from this session to a nightly hospitality suite and trade show booth. He says that communication with consultants is important and that the company will be stepping up its efforts with them in light of the Headline cotton registration. Scott says field trials have shown overall improved plant health when using Headline and that translates into increased yield and quality at harvest. Those trials started back in 2003 and have been done in several regions.